If you’re a novice to web design industry, you may be wondering what the difference between free and premium WordPress themes is (except price), and which ones you’d better go for. This question is a pretty reasonable one. If it’s the dilemma that’s bothering you, you’re in the right place. If there is the confusion between deciding to go premium WordPress or continuing with the free account, then the answer is simple. I would like to say straight to go for the premium because the totally free WordPress is annoying. The additional benefits and flexibility of premium are considerably higher than the free themes. Being with the brand, you will get frustrated only once but with non-branded stuff, you always suffering and frustrated more. 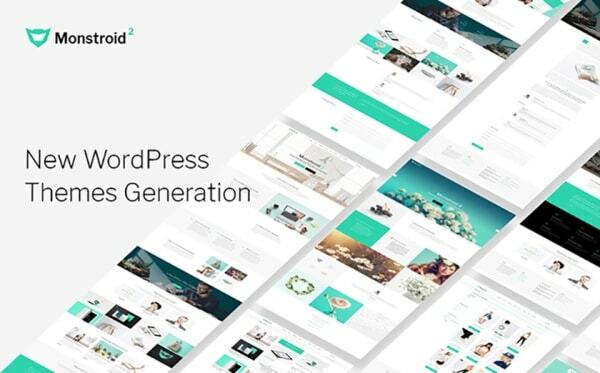 The premium WordPress themes are developed by professional web designers, with the definite purpose of providing extended support to a business for better branding. I will assist you in making the right decision. Today, we’re discussing the pros and cons of free vs premium WordPress themes and look into a couple of examples. By following this quick page you will understand whether you’d choose premium WordPress theme or free for your website, blog or brand. Free Templates: What’s the catch? Starting a blog free lowers the entry barrier for future bloggers. The idea of running a website with an attractive free theme is pretty luring, as you lose nothing if you’re not satisfied with the theme and can switch to another free theme in no time. However, there are certain things that you lose if you go for a free template. These factors are worth your careful consideration. The price, i.e. the absence of it. Having spent nothing on a theme, you lose nothing if you switch to another one. 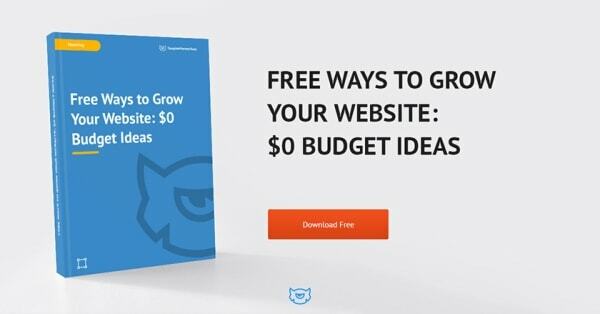 Moreover, you don’t need that much determination to power a website, if you simply get a free template and upload it to free or almost free hosting. Simplicity. Free templates tend to be pretty basic. This means that customizing a free template you won’t tackle a steep learning curve. You’ll just get the basic skills of working with a WordPress website template. Good for educational purposes. Many well-established web design companies offer a couple of their templates free of charge. In this way, they let you experience the level of quality they deliver, and try some newly-added features. At the same time, you benefit from using a free template by testing the quality of products offered and by gaining skills prior to venturing your project. Dubious quality. It’s not right to claim that all the free templates are of poor quality. It depends. The established template providers, such as WordPress.org or TemplateMonster have pretty high-quality standards. On the contrary, if you search for a free theme elsewhere on the web, you’re likely to stumble upon a flat, obsolete and functionally poor theme. So, being a novice, you have to be extra-cautious when choosing a free template. Poor functionality. Given that free themes are pretty basic, the functionality of them is pretty poor. You get no nice extras, such as plugins, widgets, shortcodes, etc. No doubt, you can try obtaining the needed plugins in the plugin market. However, this turns out to be the point to face numerous compatibility issues that you’ll need support for. Limited or no support. Even an experienced web designer may face issues with a template and seek professional support. So, never thinks that you don’t need this option. Unfortunately, free themes come with limited (e.g. a dedicated forum) or no support. So, you’ll be on your own if you face issues with the theme. Undermined uniqueness. The number of free templates is considerably lower than the number of paid ones available online. Thousands of people go for high-quality free WordPress themes and don’t even bother to customize them. So, if you go for a free theme, expect the design of your website to be recognizable and not trite. 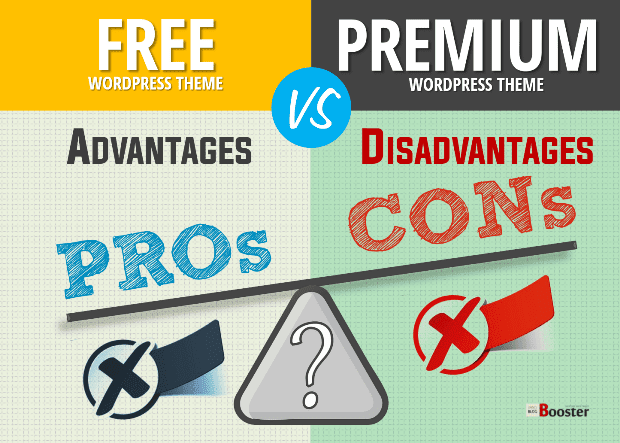 These are the pros and cons of free WordPress themes. As you can see, if you search, you can find a well-coded simple WordPress theme free. However, you’re likely to miss the functionality, support, and uniqueness of premium responsive WordPress templates. Premium WordPress Themes: What do you pay for? Premium WordPress themes typically cost around $50 -$70. For this price, you get the things that free themes don’t have: high quality, fast-responding support, and satisfying uniqueness. The need to pay this price depends on the purpose of your website and the strength of your intentions. High quality. If you go for a theme from a large template marketplace or from a well-established provider, you’re likely to get a product of high quality. Unlike with free themes, premium themes typically boast of valid and clearly structured coding. Moreover, they are better tested by QAs. An abundance of features and setup options. Modern premium WordPress themes bring you a lot of useful functionality and customization options. They may come with plugins for powering booking forms, schedule managers, online orders, extended search and other UI elements. Moreover, they typically bring you a more advanced filterable Portfolio and well-structured and informative About Us page. What’s more, the customization of premium themes is likely to be simpler with pre-built builders and WYSIWYG editors, as well as with custom settings tabs. Resourceful support. If you’re wise, you’ll go for a premium template with 24/7 support. Some web design companies offer tickets support only. The coolest ones offer you round-the-clock support via chat, phone calls and e-mails. This is a piece of cake that’s not worth passing on. Lifetime updates. The buyers of premium templates don’t want to see their website obsolete in the future. That’s why many template providers offer free updates for the themes they produce. This is a nice-to-have extra, as you don’t have to take any action to get your template to evolve over time. Desired uniqueness. The competition in the template market is strong, and web design companies keep producing newer and newer templates. That’s why not that many people go for this or that premium theme, and the new ones keep emerging. What’s more, premium WordPress themes give you more freedom of customization. As a result, you can modify the template more extensively and make it truly unique. These are the pros of premium WordPress themes that you pay your $50 - $70 for. The disadvantages of the premium themes are not that numerous. It all depends on whether you’re able and ready to pay the price. Sometimes harder to master. As with the premium theme you get lots of functionality, it’ll take your time to learn how to manage it and make it work the way you need. Moreover, it can be the case that you don’t need all the premium extensions included, and you’ll just turn them off. More demanding in terms of hosting. The full-blown, powerful premium templates have their own hosting requirements. Be ready to go for a plan that meets these requirements and don’t think of hosting your wonderful website free. Harder to switch to another theme. Each premium template is unique and has its own set of features. Consequently, if you switch to another premium template, you may lose the functionality previously offered and undermine your effort spent on customizing it. So, if you go for a premium template, you’re likely to be pleased with the website you get and with the preceding customization experience. However, you should still make a smart choice and ensure that you get a template of good quality (always check Live Demos) that comes with support, updates and handy customization tools. Let’s start out with a beautiful free template for photographers and designers. Melissa free theme has a modern asymmetrical design that actualizes well-structured, unconventional layouts. The template is provided for educational purposes. It lets you master working with custom modules and widgets and powering a stunning filterable gallery. What’s more, this free theme even brings you an extended editor – WordPress Live Customizer. 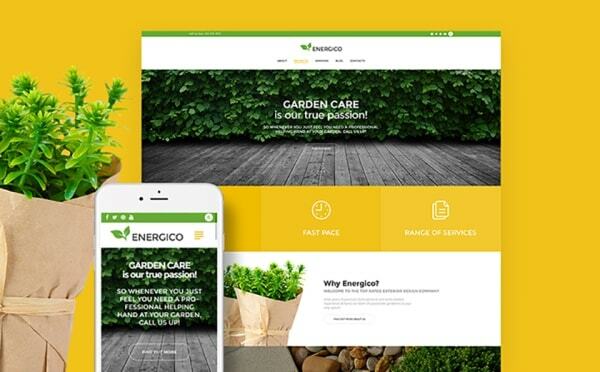 Energico is a free template made for agriculture, gardening, yard care, and garden supplies websites. It has an upbeat, clean and nature-friendly design that’s ultimately refreshing. The template lets you try out such features as Cherry Search that assist website guests in finding what they need on the fly. The team behind Cherry Framework gives this template away to let you experience the greatness of their brainchild. They’ve equipped this exterior design and gardening theme with MegaMenu panels. Basically, this free template is a great option for bloggers as its calm and minimalist design makes it a good match for powering a personal blog. Monstroid2 is a premium multipurpose WordPress theme that brings you a striking number of features and UI elements for its moderate price of $75. 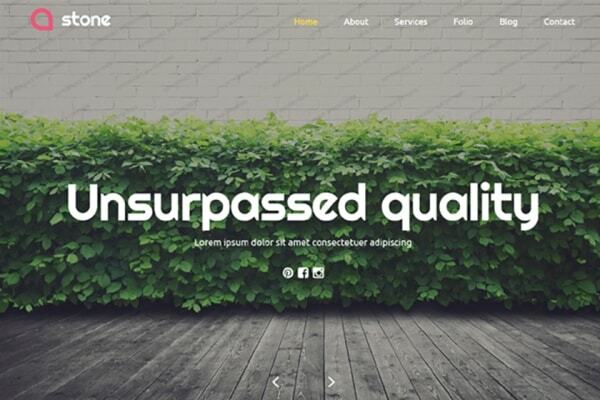 The creators of this acclaimed template accounted for customization ease by including two advanced editors to the theme (one of them being WYSIWYG). What’s more, they’ve polished the theme’s design to perfection, added skins for different industries, optimized the theme for SEO and performance and made it compatible with modern browsers. Currently, the template has 20+ premium plugins on board, which make the template a worthy investment. If you want to power a beating-the-competition corporate website, you’ll have to resort to a premium template. 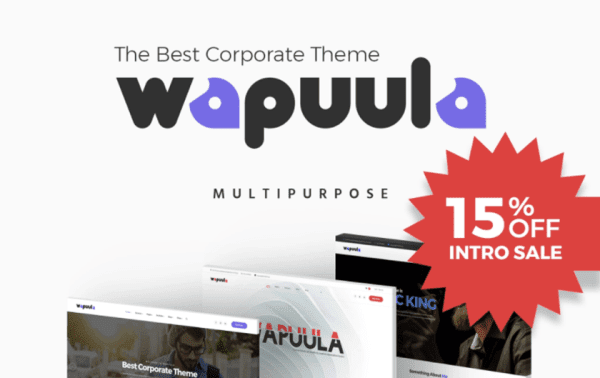 Wapuula is one of the best options on the market, combining the ease-of-customization with the must-have functionality of 2019. The pack of nice extras includes Visual Composer Builder and Revolution Slider. These are the popular premium plugins that you get free of charge with the template. In addition to this, all the high-res imagery is provided as a part of the template, allowing you to save a penny on acquiring image packs. To conclude, both free and premium templates have their advantages and disadvantages. Free templates are simple and not very unique, making them a good option if you want to power a personal or family blog without far-reaching monetizing plans. Premium WordPress themes are unique, optimized, well-tested and feature rich. They would work best for small and medium businesses that strive to build an impactful online presence. Would you rather go for free or premium WordPress themes when creating your website? Share your thoughts in the Comments section below.